Grain Science is a beautiful synthesiser for iOS. Designed for musicians, soundscape artists and SFX engineers who want to go beyond our Sylo Synthesiser, Grain Science is built on similar principles of granular synthesis, but is vastly more powerful. 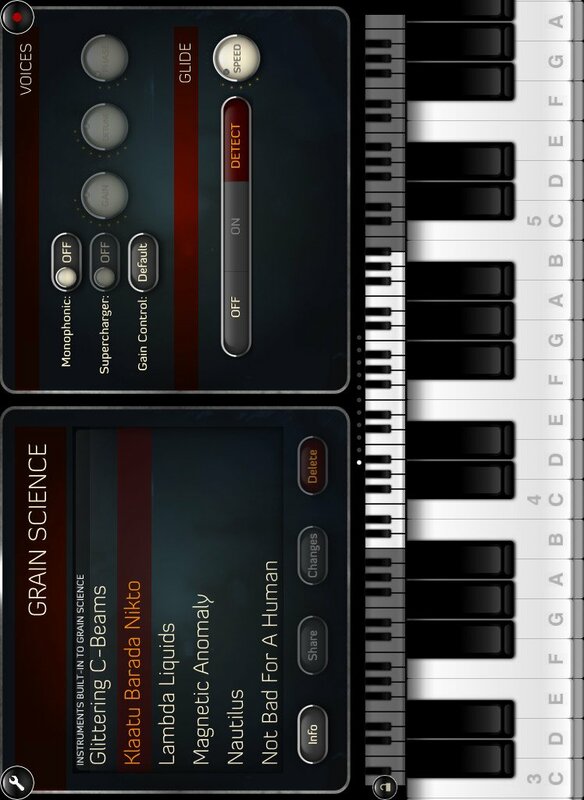 Unlike many â€œexperimentalâ€ granular apps, Grain Science mixes it up with traditional synthesis techniques to bring you an exciting hybrid synthesiser. Use the built-in waveforms, or record or import your own â€” then use the sophisticated grain engine to create something completely new from them! Grain Science is easy to get to grips with, but offers lots of depth to explore: instead of offering one or two LFOs, almost any parameter in the system can be programmed to vary over time in complex ways. Also featured are an arpeggiator with both chord and step-sequence modes; Core MIDI support, including Virtual MIDI, background audio, and â€œtap & twistâ€ learning for setting up controls; and a customisable performance screen with a collection of XY Pads and wheels.